Groove Odyssey continues its 2014 House Legend series with an extra special episode! Its all taking place at the world famous Ministry of Sound on Easter Bank Holiday Sunday, 20th April. The main room will be headlined by the one and only "Louie Vega", bringing you a quality selection of uplifting Soulful House, fused with his Latin influences - and there’s no holding back as we bring you all the way from the USA the mighty Josh Milan, the renowned artist behind a huge catalogue of hits, live on stage and in true House Legend style, with full support from Bristol's very own Sean McCabe and your residents Bobby & Steve. Room 103 will be in full swing with classic House gems headlined by Neil Pierce. In the Baby Box it's the best in 80's / 90's Soul, RnB and Boogie led by DJ Bigger and the Loft will once again will be hosted by the incredible Housefm.net playing the best in Deep House! 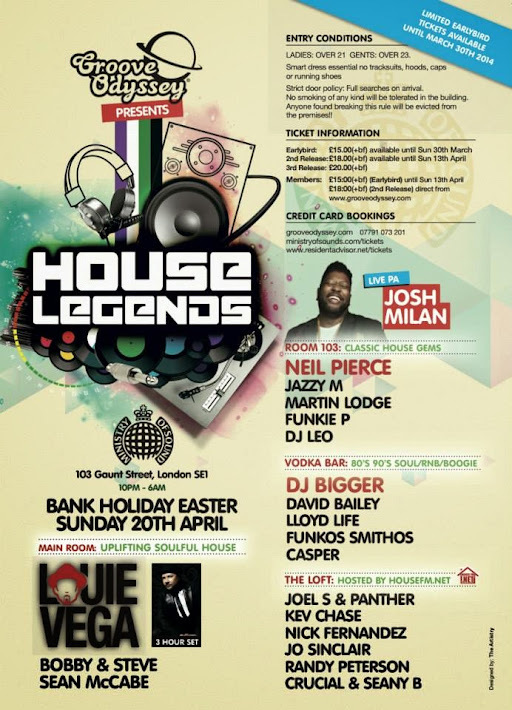 Don't miss this exclusive Groove Odyssey presents "House Legends" event on Easter Sunday 20th April 2014 at the world famous Ministry Of Sound - get your tickets early for this bonanza to avoid disappointment! LADIES: OVER 21 PHOTO ID ESSENTIAL! GENTS: OVER 25 PHOTO ID ESSENTIAL! STRICT DOOR POLICY: Full searches on arrival, No smoking of any kind will be tolerated in the building - Any one found smoking will be evicted! PLEASE CONTACT MINISTRY OF SOUND: For table service in the newly refurbished VIP area overlooking the Box and 103 please contact our VIP hostess on vip@ministryofsound.com.